Many years ago, I bought a laser pointer to play with the cat. At some point the batteries ran out and I bought new ones. A couple of years ago the batteries ran out again. Jobu was older and didn’t seem so interested in chasing it so I didn’t replace the batteries. This week I did get some batteries and decided to just see what would happen. I assumed Jobu would not be that interested in his advanced age. I shined the light on the ground near Jobu. He hadn’t seen it in cat ages. He went berserk and started chasing that red dot with all he was worth. For a good two minutes he went all out chasing that dot. He stopped and I turned off the laser. Jobu was standing right next to me and that’s when I started to hear it. rrrrrrrrrRRRRRRRRR!!! He started purring louder and louder until he sounded like a motor boat going full steam. 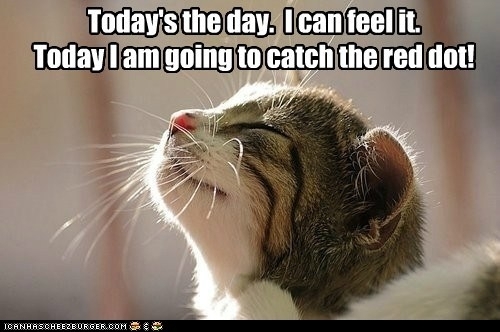 He was so happy the red dot was back.